Can’t believe we are almost half way thru October! Last thing I remember I was celebrating New year’s eve and now it is again around the corner! Time really flies but I am happy in a way because it is going to be festive season. This is my most favorite time of the year. Halloween, Thanksgiving and Christmas holidays. It all means only one thing – no wait two actually – Holidays filled with loads of good food and Shopping!! 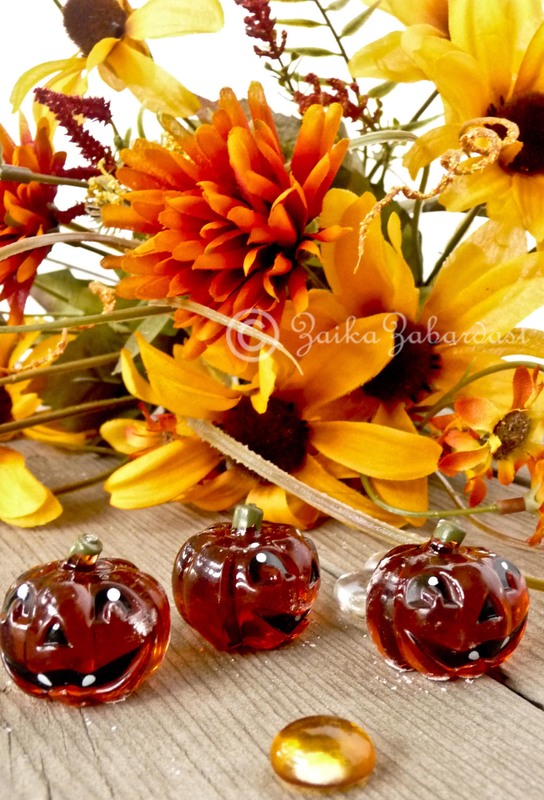 Talking about Halloween, I always wondered the relation between Pumpkin n Halloween. Why do people carve pumpkins and make Jack-O-Lanterns? So I dig up the history and found some interesting facts. I would suggest you should read it. 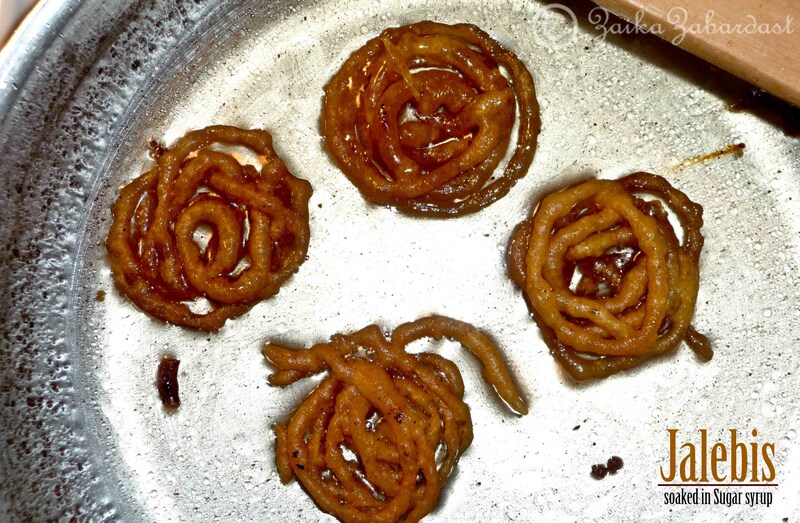 There are different variations of jalebis made differently in different parts on India using lentils, flours or even with fruits. Here I have made these using flour and yeast. It is very easy to make and super delicious. I bet no one can eat just one!! To add festive touch to it, I added pumpkin and pumpkin spices. And actually we like this one better than a proper traditional one. So here you go. 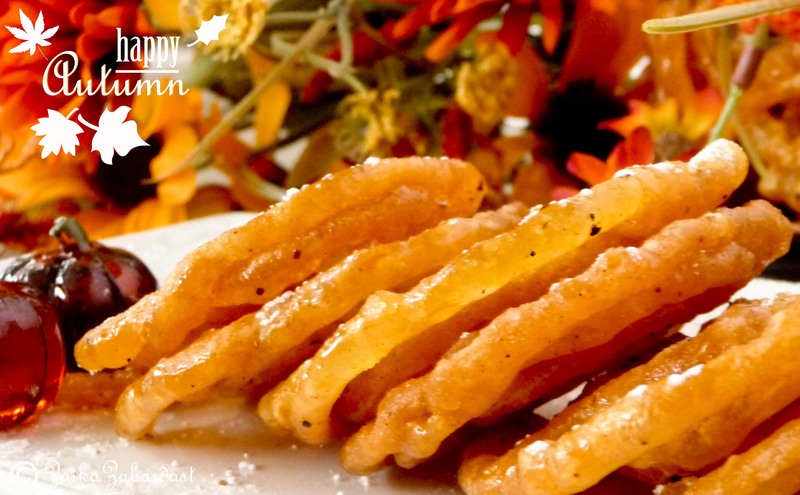 There are four different steps to make this delicious jalebis. 1. Prepare batter and let it ferment. 2. Prepare sugar syrup 3. 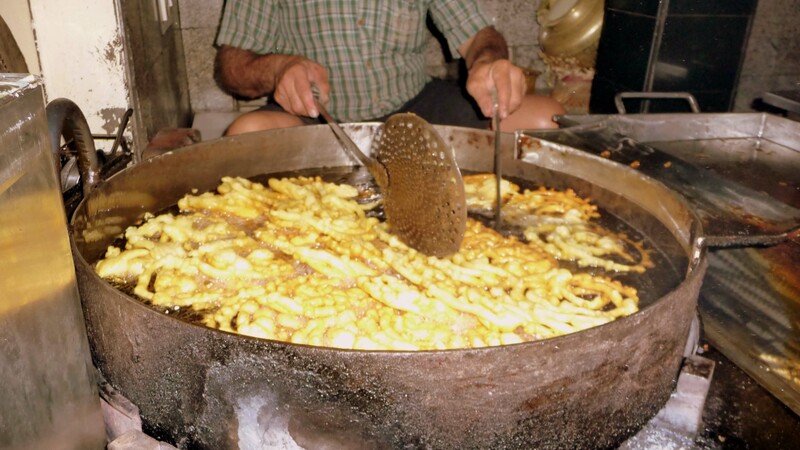 Deep fry jalebis and 4. Quickly dip them into sugar syrup. Recipe is slightly adapted from showmethecurry.com but modified according to my taste and festival. 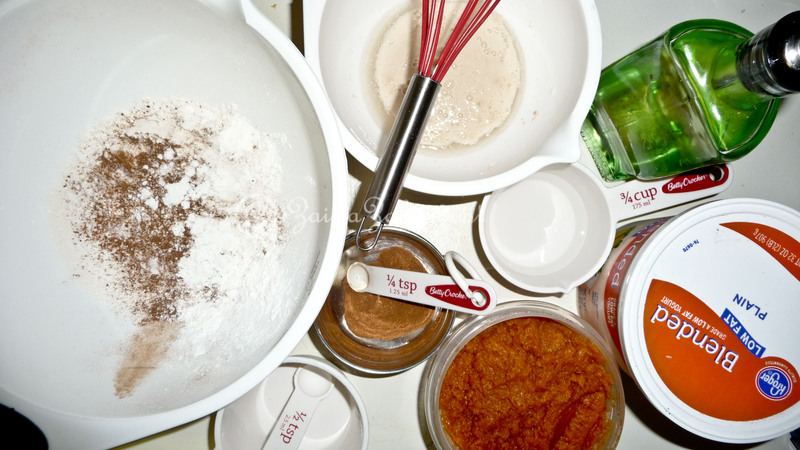 In a mixing bowl, mix flour, pumpkin spice, yeast and corn starch. Mix well. Now add Pumpkin purée, oil, yogurt to the dry ingredients. Use water as required. Mix until there are no lumps. Cover and let it sit in warm place for 30-45 minutes. Or you can use showmethecurry’s method for quicker fermentation [In a larger bowl or pot, add very warm water and place the mixing bowl with the batter inside the larger bowl (be sure that the water does not fall into the batter). Cover the larger bowl and allow the batter to rest for 30 minutes]. I have tried their method, it works well. 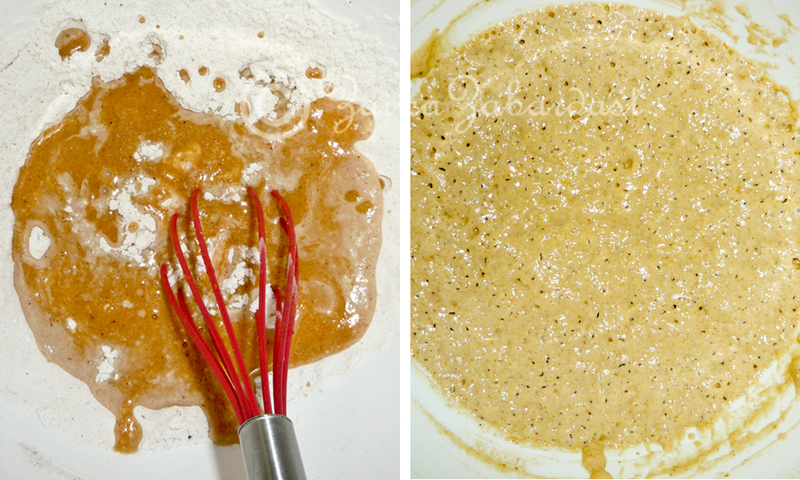 While batter is resting, start on making sugar syrup. In a heavy bottom pan, add Water, Sugar and Saffron. Cook for 15 minutes on medium heat or until the sugar is desolved completely. Reduce heat to a low and add pumpkin spice, lemon juice. Stir well. Let it simmer on very very low heat. Heat oil in a large bottom pan on medium heat. Mix the fermented jalebi batter well. Check the consistency, if it is too thick add more warm water and mix well. We want pourable consistency but not too watery. Fill ketchup or mustard bottle with the batter (You can even use ziplock bag or piping bag). With tongs, remove jabebi, shake off excess oil and place directly into sugar syrup. Allow jalebi to stay in the syrup for just a minute (flipping to coat both sides), shake off excess sugar syrup and place onto a plate. Repeat the frying and soaking procedure for remaining batter. Once all done, serve hot jalebis in a nice platter and garnish with powdered sugar, pumpkin spice mix and some chopped pistachios. ENJOY! NOTE: About mid way through the frying process, turn off the stove for the sugar syrup so that it does not become too thick. 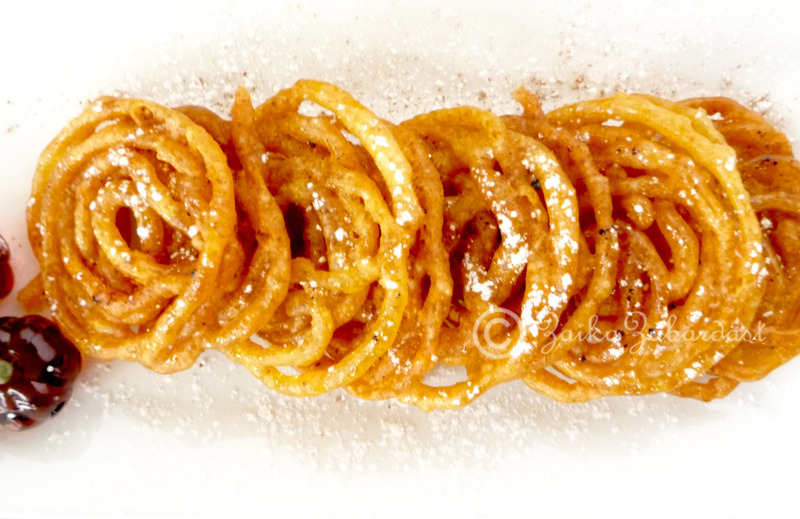 You can store jalebis in an air-tight container at room temperature for a week or in fridge for a month or so. This can be an excellent dessert to try out this Halloween!! How are you going to celebrate Halloween? Have you planned out the menu yet? Are you going to dress up for the Halloween party? Ohmigosh this look wonderful! Going to add this to the menu for next week, or possibly squeeze it in for this one. Oh Yummy, yummy, yummy. I love anything pumpkin and fried. Great treat for the fall. Thanks for this simple recipe. I always love jalebis. And we Gujarati eat jalebis on VijayaDashami. This is nice twist to traditional ones. looks so delicious. Same as you I love this time of year because it has so many festivals coming and I love to cook new recipes and sweets for my family for festive. How interesting! I love the twist you have to jalebis, Grishma! Where id you get this idea Sweety ?? 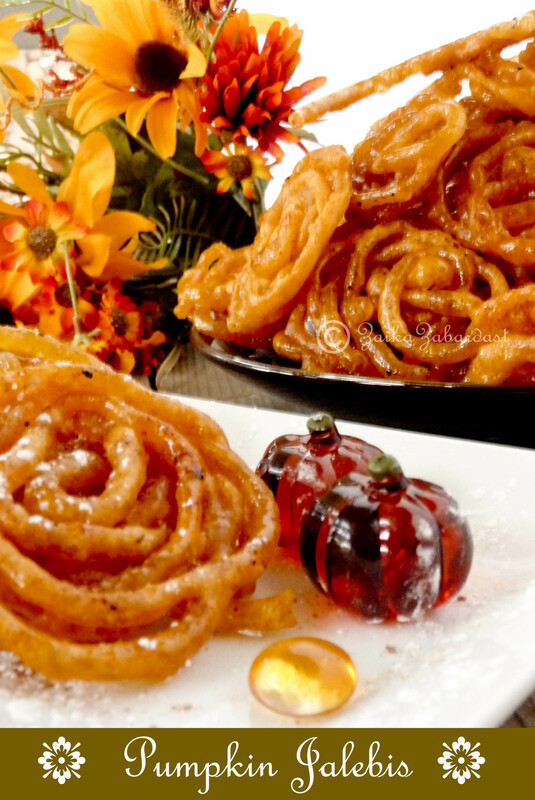 Pumpkin in Jalebi !! I really want to tell this to my local Jalebi Wala in Delhi and watch the look at his face..